Most retrievers are also indoor family pets, so flea and tick control is essential to protect people, too. A few decades ago, the typical hunting dog lived outside in a kennel environment. Modern hunting dogs spend most of their time in the house, sharing the same creature comforts as their owners. Obviously, a dog that lives in the house needs to be 100 percent free of ticks and fleas. Even dogs that live outside need protection from these insects that can and do pose serious threats to a dog's health. A dog infected with fleas is typically little more than an annoyance for man and beast, although fleas could potentially spread tapeworms or diseases to pets and people. Ticks are another matter altogether. Several species of ticks -- including the common black-legged or deer tick -- are known to carry Lyme disease. Both dogs and their owners are at risk of contracting it. Lyme disease was named for the town Lyme, Conn., where the disease was first discovered back in the 1970s. In most cases, Lyme disease manifests as an isolated inflammation that causes considerable joint and muscle pain. After only a couple of days, an infected dog can be disabled to the point the animal can't walk. Thankfully, modern flea and tick controls do an affordable job of not only repelling and killing these pests, but making sure their eggs don't begin new generations. 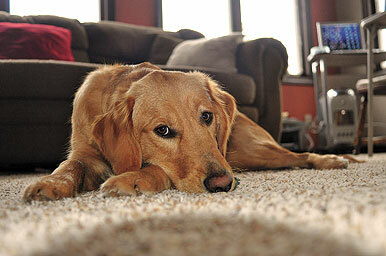 A number of products are designed to provide pest control for retrievers. Spot treatments, shampoos, sprays, powders, dip concentrates and traps are all viable options. The most popular are spot treatments that apply an oily chemical to the animal's back, usually between the shoulder blades. The oil soaks into the skin and provides complete protection from fleas and ticks for four weeks per application. Spot treatment flea and tick medications are typically made up of two different chemicals. The chemical fipronil is an insecticide that disrupts the nervous system of fleas and common ticks. In short, the fipronil kills fleas and ticks that come in contact with the dog. A second chemical, S-methoprene, is an insect growth regulator that kills flea eggs and larvae. This two-part system provides both a waterproof option and long-lasting benefit to the dog. The amount of spot treatment required is based on the dog's weight. These products are sold accordingly, and it is important to match the product dose to the dog's size. Indoor dogs are susceptible to fleas and ticks at any time of year. Not surprisingly, most vets recommend treating dogs year-round for comprehensive flea and tick control.